Everybody talks about unnatural links and their impact on the SEO world. While some things are well known, when it comes to search engine optimization and spammy links, there is still a lot of obscurity on the subject. To shed some light on this matter, we’ve run an in-depth analysis based on more than 100k inbound links. Some of the findings are really surprising, while others bring a clear confirmation to some really popular assumptions. The unnatural links have eaten the SERPs alive all these years and the “good” links keep fighting their way back. Lots of websites suffered and ended in dreadful situations regarding penalties because of SEO spammers who called themselves “SEO experts” and promised to offer high rankings in Google by building awful links or business owners who followed old tactics. Either way, the damage remains. The current research contains lots of insights on the unnatural link matter, aggregating information on metrics such as unnatural and suspect link percentage, link issues, commercial and brand anchor text percentage, webpage type and link positioning, dofollow and nofollow links, average domain influence, search visibility, etc. We recommend you to read everything thoroughly; yet, if you think that you don’t have time to read everything now, you can jump to the main takeaways. After analyzing the data we saw that most of the websites (39.9% of all websites) have up to 10% unnatural links. Is not bad, but it’s a small percentage if we were to think about it. 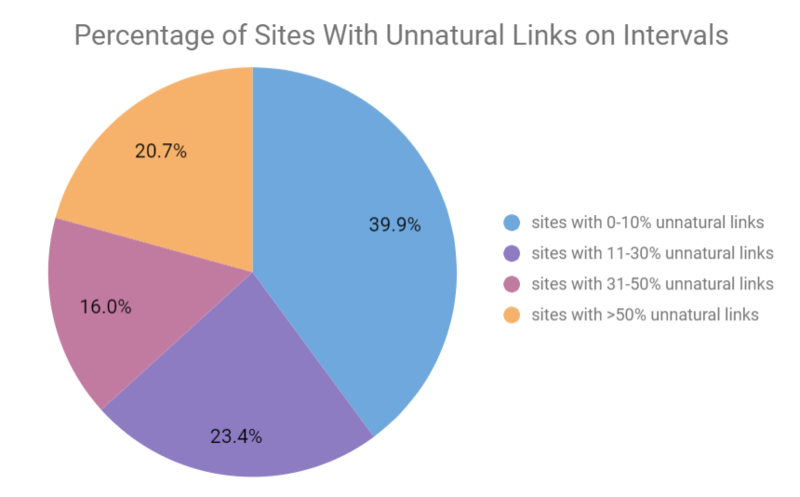 Up to 30% unnatural links represent more than half of the links (a total of 63.3%). 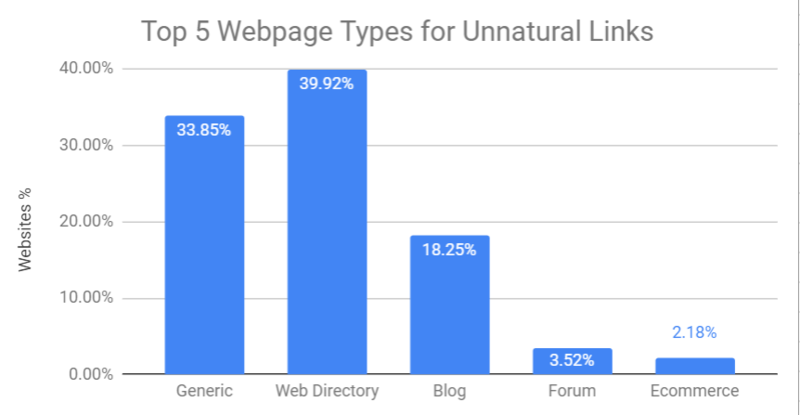 An even worse situation is if we look at the percentage of websites (20.7%) that have over 50% unnatural links. comprising over 50% unnatural links of all links. If we compare this chart with the next one, where we’ve summed up unnatural and suspect links together, we can see the differences between the pie charts. The number of websites that have over 50% unnatural and suspect links is almost a quarter or the total amount of websites – 24.8%. 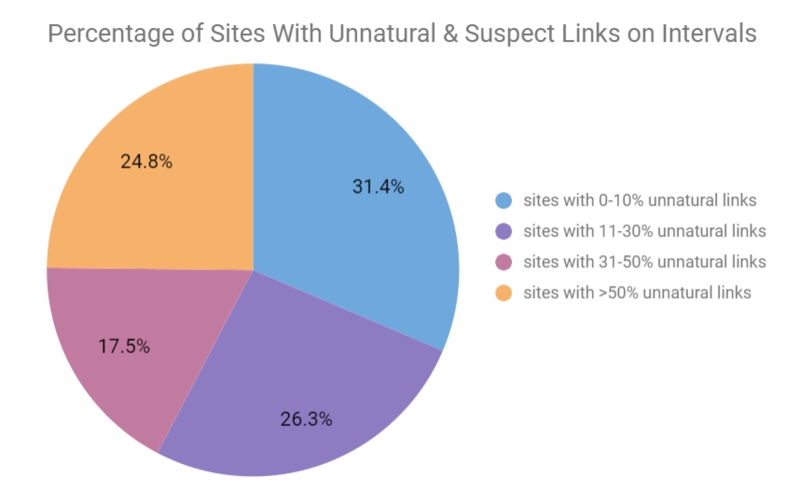 And the number of websites with up to 10% unnatural and suspect links is smaller than the first chart – 31.4%. But overall the situation looks worse. The cognitiveSEO tool triggers a penalized flag when a website has more than 30% of their backlink profile containing unnatural links. And when we look at our situation, we see that there is a significant amount of links with over 30% of unnatural links. By now you might be thinking of how we classified or what we considered to be an unnatural link. 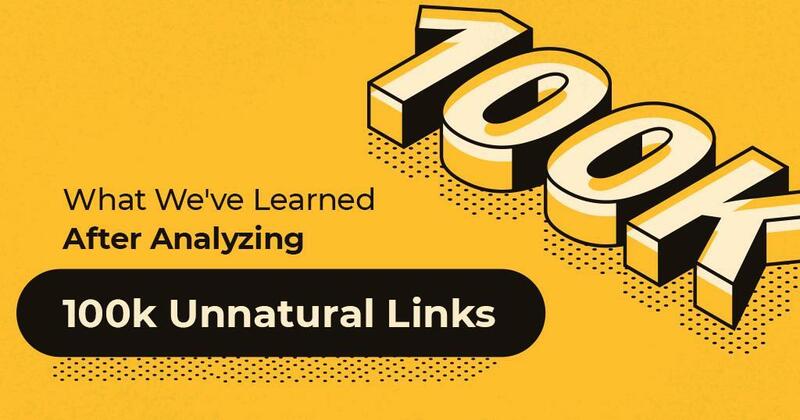 unnatural link: links considered unnatural by Google. The tool uses over 50 rules to classify unnatural links. suspect links: links that could be unnatural but need a manually double check investigation. Context can change a lot in terms of the naturalness of a link and this is why some links cannot be algorithmically classified but need manual curation. OK links: links that seem to have no issue. Below you can see a printscreen taken from the Unnatural Link Detection tool. Our research is based on the analysis of almost 8,000 websites which have thousands of unnatural links. We looked at the influence carried by those links and analyzed the main unnatural issues. For each website, we had a list of issues. 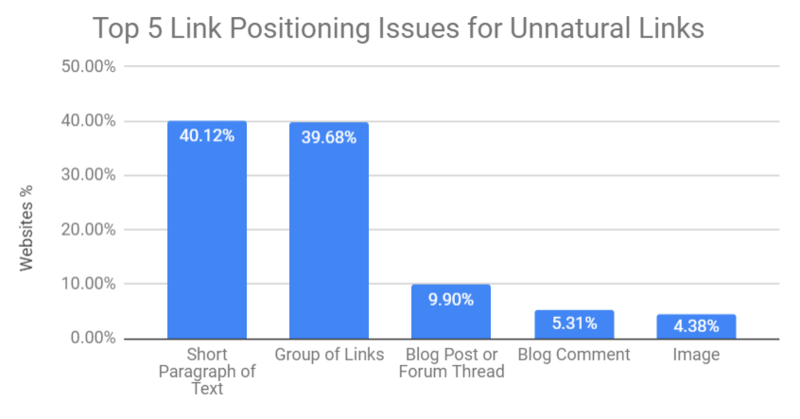 We calculated the frequency of the issues and you can see in the chart below the top link issues for websites with unnatural links. A low influence link is one of the most widespread link issues. A low influence link is a low quality link, which can have low influence because of lots of reasons, in addition to web-directory links, suspect anchor text, or suspect pattern link. There is no secret that low influence links or links coming from web directories are most of the times spammy links; yet, what is surprising here is that these issues are still encountered today, as they were 10 years ago. forum comments with optimized links. 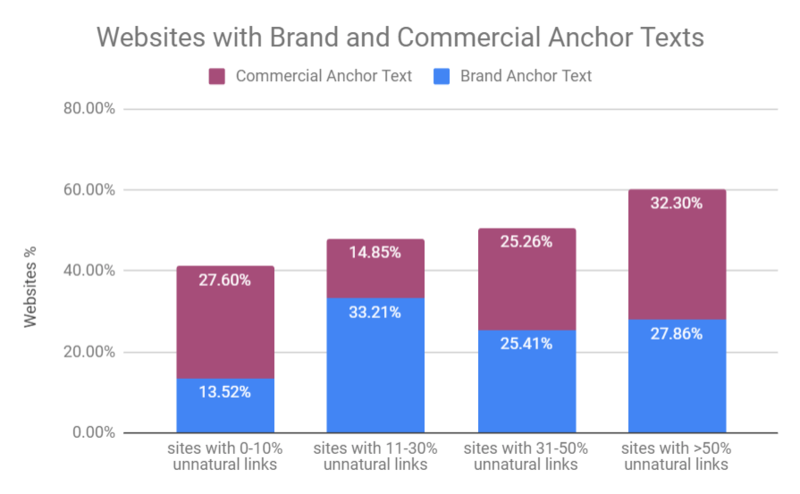 According to the graphic below, we can see that most of the commercial anchor texts are found within websites that have a high percentage (over 50%) of unnatural links. For you to make an idea of how we tackle anchor texts, let us explain a bit how we defined brand and commercial keywords. 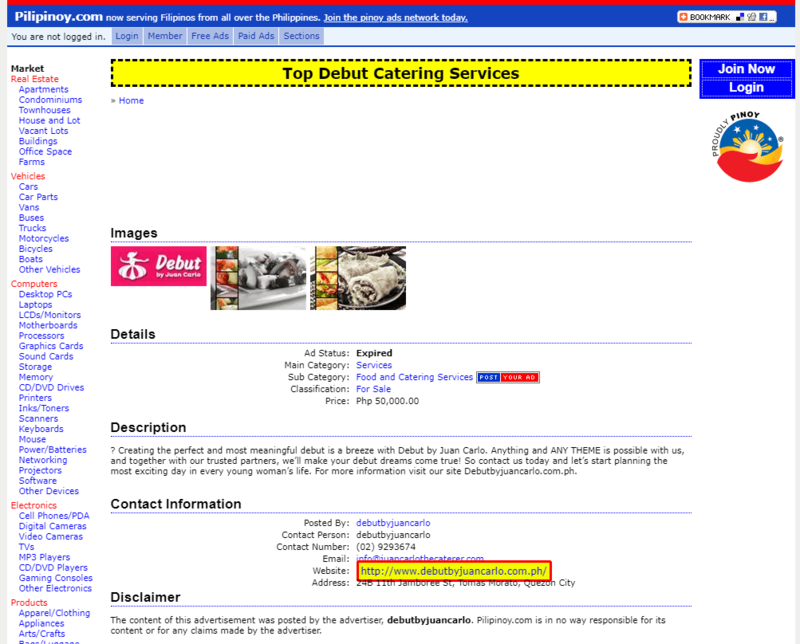 The brand anchor text contains the name of the business or domain name. Commercial keywords (or money keywords) are all of those keywords relevant for transactional searches, keywords that match queries to real buyers. In our case for instance, cognitiveSEO would be a brand keyword while best SEO tool would be a commercial keyword. One thing is clear: commercial anchor texts have a higher distribution for websites with unnatural links. So it was a surprise to see so many brand anchor texts for the unnatural links. We analyzed the brand anchor texts for the unnatural links to see why there are so many. And we realized that is actually a connection with the top link issues discussed above. Most of the unnatural links with a brand anchor text are coming from web directories. Below you can see an example of such kind. You can see that the link is on the website and the domain name, but the website looks really spammy and we all know that Google doesn’t like web directories or any listing websites. For determining the link building strategy we analyzed the Webpage Type, Link Positioning, Webpage Category. Webpage Type is a metric that profiles backlinks by their structural type. This means you can see exactly the type of page it’s linking to, whether it’s a Blog, a Forum, an Ecommerce site or maybe a News site. The Link Positioning metric classifies each analyzed link by its type (Blogroll, Blog Post, in Content Link, etc) and Webpage Category identifies the contextual relevance between the site and its inBound Links. According to our study, it looks that web directories are the main source for spammy backlinks, followed by generic websites, blogs, forums and ecommerce. Web-directories were a big hit in the glorious old-days of black hat SEO. They have been with us since the beginning of black hat SEO. If you look at the print screen below, you can see how web directories searches changed over the years. It started big, then it went down and the popularity dropped, but some people are still using them. Web Directories don’t have a good image anymore in the SEO world. Matt Cutts said that the Google team looks at the value of the directory and how much work is put into it. If it’s not substantially a lot of work and, primarily, it looks to be more-less a link scheme, then paid directories are held to the same standards as paid links. Since our main source of links are web directories, it turns out that the top two link positionings are related to that. During our study, we saw that most of the unnatural links are placed in short paragraph or text and in groups of links. 40% of the websites had unnatural links in short paragraph of text and 39% of websites in groups of links. The study shows that links placed in short paragraphs of text and in group of links are the top link positioning schemes used by spammers. Besides the information we discussed above, regarding the link strategy, we were also interested in finding out the link equity or link juice transferred and the type of value assigned to the rel attribute – dofollow and nofollow. We know that “dofollow” is not an attribute on itself but we are going to use it here to make a distinction between links. As you can see in the chart, all the websites with unnatural links have a high number of nofollow links. And out of the total links, less than a quarter are dofollow. We’ve been fed with the belief that dofollow links might be mostly for unnatural links; but it seems that that’s not necessarily the case. We admit that the data discovered reflects only findings on a set of links, but still, the results we’ve discovered here are quite interesting. Since most of the unnatural links are nofollow, as you can see in the chart above, we started to believe that the questions “Should I disavow nofollow links?” has new directions. The nofollow links saga continues, after long and heated debates among online marketers and SEOs. Judging by our findings here, we can say that disavowing nofollow links is not a matter of choice anymore. You should think about removing or disavowing links that look spammy and have a high risk for your backlink profile even if they are nofollow. They can impact the whole quality of your backlink profile. If they are nofollow, that doesn’t mean they are risk-free. Since dofollow links were known for being unnatural in a high percentage, it became a standard as far as natural links go. But if we look at the results of our study, more and more major publishers start to switch to nofollow. This can definitely influence other spammer practitioners to do this as well. And Google’s John Mueller said to disavow bad links, no matter if they are dofollow or nofollow. Disavowing or cleaning up bad links to your site may help Google’s algorithm trust other links to your site. The nofollow drama started to be more complicated since lots of publishers abuse the practice, so that good nofollow links and spammy nofollow links got mixed. We had an entire talk about the impact of nofollow links on SEO where you can find if they are they still worth having. In our study, we checked the Domain Influence for the unnatural links to see the average value. It turns out that the higher the unnatural backlink profile is, the lower the Domain Influence goes. The Domain Influence is a similar metric that includes the domain authority, a crowd-sourced metric measured from 0 to 100. A direct correlation between the unantural link and the search visibility wasn’t done in the present study, yet, judging by other researches we made it seems that the highest the unnatural backlinks profile, the highest the chance to get fluctuations on the search engines and no visibility on the long run. We’ve written several researches on this matter, and in almost all cases, a high number of unnatural links caused a major drop in search visibility. And if you’re looking for a tool that can do all that and even more, the cognitiveSEO toolset is always here for you. the average Domain Influence for the whole backlinks profile and for the unnatural links only. over 50% unnatural links out of the total links. We had some pretty interesting SEO facts discovered in our study. We debunked some SEO myths and got new leads and strategies to put in place for future investigations. Below you can see our top 10 takeaways. Almost all websites have some unnatural links, with a third of all of them have over 50% spammy links. 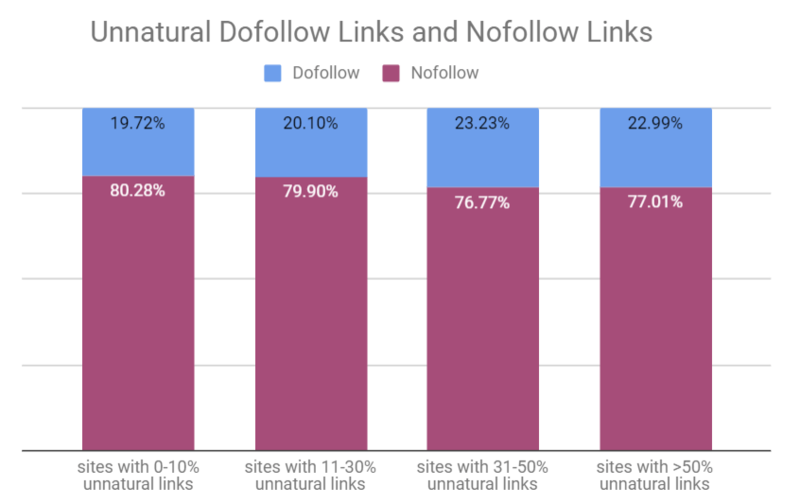 Obviously or not, most of the unnatural links have no influence, and a third of all analyzed websites have a low or no influence links. Web directories are on the top list of unnatural tactics and (probably) black hat SEO strategies. Most of the unnatural links are placed mostly on short paragraphs of texts and groups of lists. Commercial anchor text are not necessarily the trigger to unnaturalness. Most of the unnatural links had the rel=”nofollow” tag, contrary to popular beliefs that nofollow links are “safe”. Mostly dofollow links seems to be natural, non-spammy & relevant links. We might need to change our approach regarding disavowing nofollow links. Unnatural links highly affect websites’ Google visibility . Unnatural links are correlated with lower Domain Influence score. 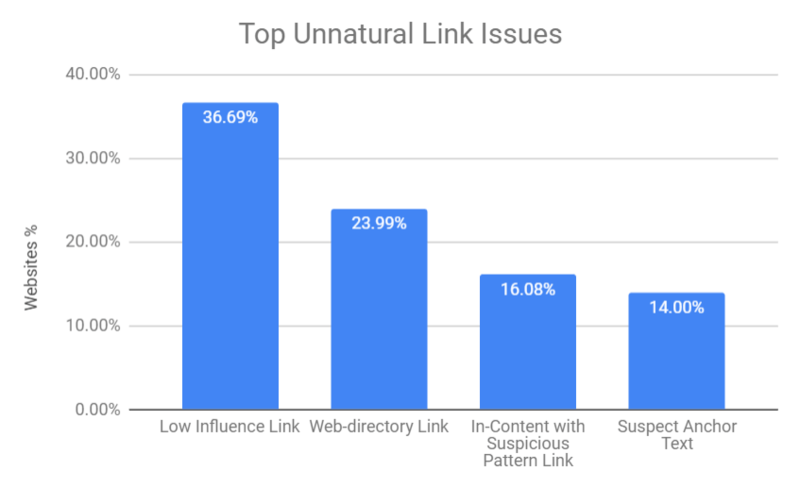 The post We Analyzed 100,000 Unnatural Links and This Is What We’ve Learned appeared first on SEO Blog | cognitiveSEO Blog on SEO Tactics & Strategies.